Top PayPal Alumni: "Silicon Valley Lacks Radical Innovation"
It was a sold out event: Peter Thiel and Max Levchin at the Inforum Club SF - the club for under 36 year old members of the Commonwealth Club. Mr Thiel and Mr Levchin are two prominent members of what some call the "PayPal Mafia." This is a large number of unbelievably successful entrepreneurs; the Paypal alumni have gone on to help found an extraordinary number of successful startups. 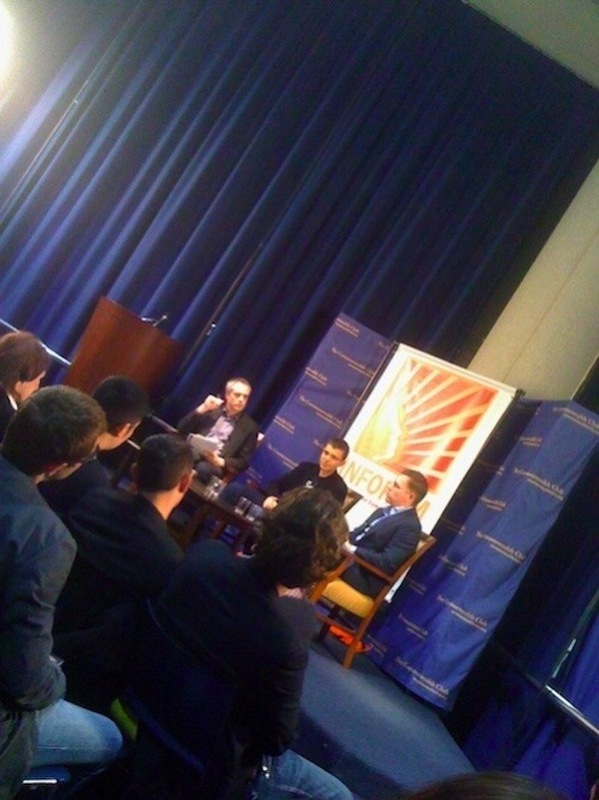 The first time I met Messrs Thiel and Levchin I was working at the Financial Times, not long before the PayPal IPO. The IPO was successful and soon after, Ebay bought the company for $1.5 billion. A big chunk of that Ebay money went back into the Silicon Valley economy, funding dozens of startups, such as Facebook, Twitter, LinkedIn, Tesla, etc. Later at SVW I would meet regularly with Mr Levchin as he showed me the first version of Slide - a simple photo slide web service (sold six months ago to Google for $200m) and Yelp, the successful global restaurant review site. The pair were slightly bashful Wednesday evening in San Francisco, sitting under bright lights as Brad Stone from BusinessWeek ran through a list of questions. ML: Groupon is probably under-valued. The fastest growing company ever. I came across a startup recently that had a Powerpoint and no engineers, no product and it had a $16 million valuation. That's an over-valued company. PT: There is no bubble in tech. This is not like 1999. But valuations are all over the map. ML: It's using Y Combinator as an Index Fund. It's not true anymore that YC has small companies. But it shuts out some of the more value conscious angel investors. PT: It's a brilliant move. Some of those companies will become very valuable. PT: There is not enough happening to take us to the next level. There is an extreme disconnect. Outside Silicon Valley, California is nearly bankrupt. Need to do more. ML: There is no insane abandon. When I was growing up, the space race galvanized an entire generation, my parents' generation. There is nothing similar. Today, the news was dominated by reports of an iPad 2 screen, it's not that radical. It takes a JFK to motivate a new generation to create the rhetoric. No one in government is doing that. PT: Everything is short-term focused no one is looking into the future, 15 to 20 years like they used to in our parents' generation. A lot of what our parents generation did: building interstate highways, Manhattan Project, etc, could not be done today. PT: It's a project that we helped fund to encourage discussion and we are looking at business plans n this area. ML: It's not for me, I get sea sick very easily. PT: It is good to wait. Google set the precedent. If it had gone public earlier, Microsoft, Yahoo, AOL would have probably been able to figure out how to compete with Google. That's why Facebook is waiting (he sits on Facebook board). The Goldman story and reaction was probably part of the general anti-Wall Street saga and not much to do with the Facebook investment. ML: We went public (PayPal) just before Sarbanes-Oxely and it was very onerous. I slept at the printers for several days with lawyers kicking me awake to ask about patent issues. Once you go public it is a big distraction to staff, they are checking their stock price all the time. If it is down, they are depressed and when it is up, nothing can touch you. When you go public your organization is probably working at half productivity. Going public slows you down, you should make sure you get most of your innovation done first. You should make sure, as Meg Whitman once said, that monkeys can run the train, then it doesn't matter that your productivity is down. ML: They got people, ideas and a lot more. I'm sure they at least got their monies worth. I can't say what I'm working on. One thing I've learned in 6 months at Google is that it is good at keeping secrets. PT: Google is focused on people and not products. It wants the smartest people and that's the competition with Facebook. When the top engineers started joining Google instead of Microsoft that was bad for Microsoft. ML: There is not enough radical innovation in Silicon Valley. Focus is too narrow. Too many companies that are featurettes. PT: For investment, we look for a powerful narrative and people looking to change the world. That's very rare. How will you recruit that 30th or 40th employee? What will motivate them to join the company? We need breakthrough tech. ML: There are lots of opportunities in the cracks where PayPal isn't, lots of new features are needed. PT: I'm glad I didn't know about payment systems before PayPal. It's very hard, it's a chicken and egg situation, payments are a networked product. How do you get started? PT: I don't believe in the wisdom of crowds, it's over rated. I don't see too much ground breaking tech coming out of China, there are too many other ways to make money there, and things to be done first, such as MacDonald franchises. ML: I invest in areas that I know and in countries where there is a rule of law. I've invested in the Ukraine but have lost money so far. What is your idea to change the world? PT: We need breakthrough technologies in many areas, applying computer technologies to biotech, agriculture, etc. ML: We should be willing to take more risks as a society, such as develop safer nuclear energy and also develop better healthcare, fix our bodies. Afterwards, the two spent a fair amount of time answering questions from the audience and many were looking for investments. I'd love to know why the "PayPal Mafia" have been so successful. After all, there are plenty of other successful alumni around but none that can be so closely identified in such a large group. - Steve Chen - Youtube co-founder. - Chad Hurley - Youtube co-founder.